Vermont Democrats have long planned to attack Republican Lt. Gov. 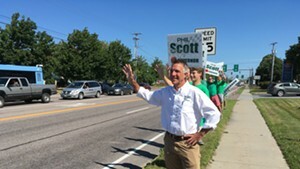 Phil Scott over his excavation company's contracts with the state. On Monday, his gubernatorial primary opponent beat them to it. In a new television advertisement, Republican rival Bruce Lisman notes that the company Scott co-owns with his cousin, DuBois Construction, has done $3.8 million worth of business with the state since Scott was elected to the legislature 16 years ago. "Incredibly, Scott says, if elected governor, his construction company will continue pursuing government contracts," the ad's narrator says. "That's unacceptable — and a total conflict of interest. Time for a change." The ad also mentions that DuBois performed work on Gov. Peter Shumlin's East Montpelier home in the spring of 2012, citing a Seven Days story from October 2015. Lisman, a retired Wall Street banker, has spent hundreds of thousands of dollars on negative TV ads and mailers — mostly seeking to tie Scott to Shumlin — but his latest ad is his harshest yet. The primary takes place in just eight days, on August 9. Later Monday, Scott campaign coordinator Brittney Wilson called the ad "another Lisman lie." 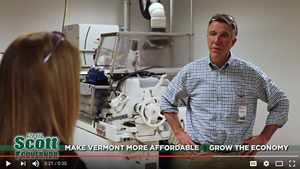 "Only a Wall Street millionaire would attack a small family business owner who has spent 30 years creating jobs here in Vermont. In contrast, Lisman spent 30-plus years working for the two firms that went belly up in the recession that their greed caused," she said, referring to the investment banks Bear Stearns and Lehman Brothers. "And while the American economy tanked and working families lost their homes, he walked away with millions of dollars that he's now using to spread lies about a lifelong Vermonter and small business owner." Scott defended DuBois' state contracts last September, arguing that all were public and most underwent competitive bidding. He said only 10 percent of the company's business came from the state. 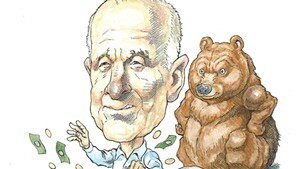 Scott said he would not sell his stake in the company if elected but would separate himself from its operations. 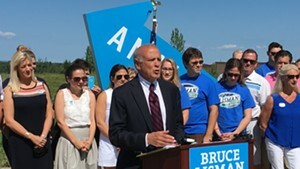 Lisman criticized that position Monday in a written statement about the new ad, saying it "would not meet even the most basic ethics standards in most states and countries." "If Phil wishes to remain in public service, he should immediately remove himself from DuBois Construction and sell any and all business interests that have conducted or potentially would conduct business with the State of Vermont," Lisman said. "Phil must decide to either serve the people of Vermont or serve the interests of his company, but not both." Lisman wasn't the only one taking shots on Monday. 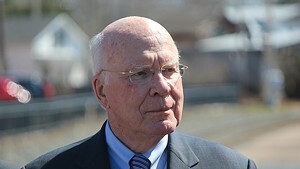 Late in the day, Scott's campaign emailed supporters with what it called "the first in a series of fact checks" it would issue before the election. 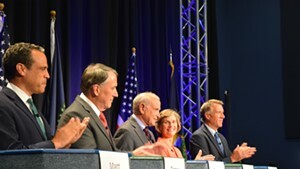 The first questioned Lisman's affiliation as a Republican, citing numerous press reports in which the candidate and others referred to him as an independent or a Democrat. 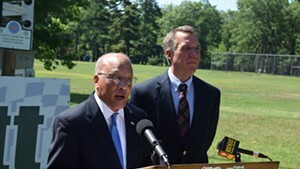 "Bruce Lisman is spending millions of dollars to mislead Vermonters with dishonest ads about Phil Scott's plans, priorities and record," Wilson said in the email. "Team Scott thinks it's time Vermonters knew more about The Real Bruce Lisman."